As Trump rails against “fake news” while presenting “alternative facts,” blatant lies, and trenchant denials, all opposition becomes the enemy, and all who oppose are branded liars. Language has become trivialized and ideas relevatized; rational dialogue is all but impossible. The late social critic, philosopher, and theologian Jacques Ellul, in his book The Humiliation of the Word, tells us that the word is the essential reality, the word is what separates humans from the animal world. Another of my favorite social critics is the eminent linguist Noam Chomsky, who, unlike Ellul the Christian believer, is an atheist. Both Chomsky the atheist and Ellul the Christian have a profound faith in the word. Both believe that language is what makes us human. Chomsky believes that there was no extensive evolutionary development of language; it surprisingly did not evolve from our ancestral ape relatives’ use of simple sign language. “The reality,” he says, “is becoming increasingly clear that the uniquely modern (human) sensibility was almost certainly crucially abet- ted by the invention of what is the single most remarkable thing about our modern selves: language” (What Kind of Creatures Are We?). It is interesting in view of Chomsky’s reflection that human language emerged not in an evolutionary process, but rather spontaneously in the last 100,000 years, to reflect from a scriptural perspective that the Universe was created by the spoken Word of God in an instant. And further, that when God created man, the first act of humanity was language. For Chomsky, the scientific linguist, the emergence of language, along with humanity itself, is a mystery. But for Ellul it is clear that God is the Word, and God created the universe by the power of the Word and that God created humanity and gave humanity the power of language and naming: “The Lord God formed…various wild animals and various birds of the air, and he brought them to the man to see what he would call them. What- ever the man would call them would be their name” (Genesis 2:19, quoted in The Humiliation of the Word). Chomsky, on the other hand, devotes himself, unlike Ellul, to reflection on the connection of words and thought. We cannot actually think without words, and Chomsky finally concludes that language and thought are pretty much the same. As we move deeper into the Trump presidency, language has become the issue of the day. In a recent Atlantic article, David Frum writes: “By filling the media space with bizarre inventions and brazen denials, purveyors of fake news hope to mobilize potential supporters with righteous wrath—and to demoralize potential opponents by nurturing the idea that everybody lies and nothing matters. A would be kleptocratic (like Trump) is better served by spreading cynicism…The inculcation of cynicism breaks down those forms of media that try their imperfect best to report the truth and those that purvey falsehoods for reasons of profit or ideology.” As Trump rails against “fake news” while presenting “alternative facts,” blatant lies, and trenchant denials, all opposition becomes the enemy, and all who oppose are branded liars. Language has become trivialized and ideas relevatized; rational dialogue is all but impossible. We have entered a new era, in which the word is no longer significant. We have fully entered into the era of what Ellul calls technique. Twitter technology makes traditional print and even televised media superfluous. When he called his first and only press conference to date, it was merely to castigate the press for presenting “fake news.” President Trump does not need the media. He can just send out a tweet. Ellul, the social critic, philosopher, and theologian, died in 1989. He was the author of over forty books and innumerable articles. As a young man, he was a member of the Communist party and the French resistance, and after the war served as mayor of Bordeaux. He taught history and law at Bordeaux University. In his post-war years, he converted to Christianity. Influenced by German theologians and the so called school of “Christian realism,” he joined a conservative branch of the Dutch Reform Church. This is the time to return Ellul to the forefront as the prophet of technology’s dark side. All of the criticisms of Trump can be reduced to the impact of technology. He does not need to talk to the press because he can communicate with his base directly through Twitter. He is a billionaire, a brash bombastic television personally who has perfected the 30-second invective that tells the story without tedious details. He is the perfect post-utopian tech president: a billionaire television “reality show” host, whose one liner, “You’re fired,” is word enough for his constituency. The visual world of television advanced him to the presidency, but the Twitter direct feed to his base will put the end to both television and print media. As a Protestant and Biblical literalist, Ellul is distrustful of images or “idols,” as the Hebrew scriptures would call them. For Ellul, the modern technological reality is a world of images. Thus Donald Trump is the apotheosis of our image-oriented world. Images are reality and seeing is believing. But the word causes us to reflect. It does not really matter whether the word comes from scripture or Shakespeare or The New York Times; words are the source of critical thought. Words cause us to ask questions of the reality presented in front of the television or the computer monitor. Donald Trump, on the other hand, is a man of few words and uncomplicated thoughts; he is a perfect leader for those who desire the same. In Humiliation of the Word, Ellul attacks a scholarly enterprise called “post structuralism.” His conflict with that project is that it reduced words and narrative stories to visual signs and symbols, a some-what complicated concept but basically found in our current situation, a conflict between the critical, reflec- tive word and the visual, unreflective symbol of Donald Trump and the world of ascendant, image-oriented technology. Language is what makes us human. As Ellul reminds us, language is always ambiguous; and as Chomsky declares, we are working with the infinite possibilities of language within a finite mind. Ellul has a deep preference for the word over the image. He believes that over the last two centuries, Western culture, under the influence of technique, has be- come more image-oriented. Ellul associates the word with truth, whereas he associates the visual world with visual reality and image. While in our contemporary world, “seeing is believing,” for Ellul, “reality,” visual reality, cannot convey truth; it can only convey spectacle. And human beings tend to be paralyzed by spectacle. We watch television and become anesthetized; our minds are turned off. On the other hand, we read a book and we ask, What does it mean? When we see something, it is unquestionable “reality.” But when we hear a sound in the night, we ask, What was that? Now, in Donald Trump, we have a “reality” TV president for whom the word means nothing, for whom truth is relative, and for whom image is everything. He puts his name on everything that he owns. Language itself is equivocal, but to deliberately diminish the power of language, as the Trump team does with lies, is to cut into the very heart of what it means to be a human being. And as Masha Gessen notes in the New York Review of Books, it is not that Putin and Trump lie, it is that they lie in the same way and for the same purpose: blatantly to assert power over truth itself. 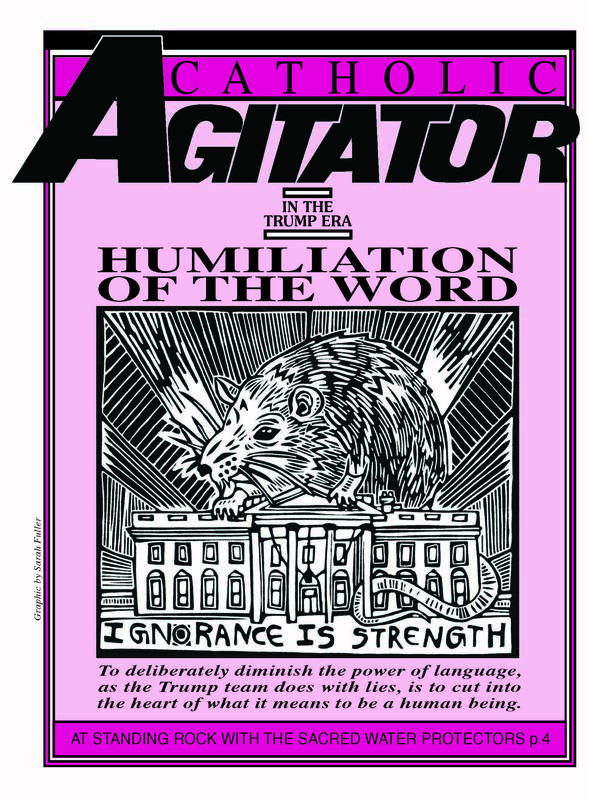 Jeff Dietrich is an LACW community member and editor of the Agitator.